The Mall of the Future…on Buford Highway? A lot of stories these days tell us the American shopping mall is in trouble. But Buford Highway’s Plaza Fiesta might set an example for an entirely new model of mall. Or maybe it’s not so new after all. WABE’s Kate Sweeney has the story. The story of a new kind of shopping mall starts with the story of some of the very oldest shopping malls. These were conceived of by a man with a vision. His name was Victor Gruen. He was an architect from Austria who wanted to bring the town square of his youth to the nation’s burgeoning suburbs. He imagined a new kind of space: the shopping mall. Gruen’s malls were climate-controlled, traffic-free versions of those town centers, complete with city halls, doctors’ offices—and shopping. And the mall did catch on. It never became the community space Gruen envisioned, but instead, grew into a commercial powerhouse that ran strong for decades. But then in the 1990s, that powerhouse began to stall out. Analysts give a lot of reasons for this: There were too many malls built in the first place, the growing class-divide means fewer people are shopping at mall department stores and, of course, internet shopping. At any rate, these days, shopping malls generally do not produce the draw they once did. One of these is Plaza Fiesta, housed in the structure that was the once-upon-a-time home to the Buford-Clairmont Mall, one of those malls that did fine in the 1970s before experiencing a steady decline. Meanwhile, visit Plaza Fiesta on any given Sunday afternoon, and you’ll see a version of Victor Gruen’s old vision: the thriving town plaza. As he talks, he offers up a slice of a treat you’re not likely to find at Northlake or Lenox Mall: fresh coconut drizzled in chili and lime juice. 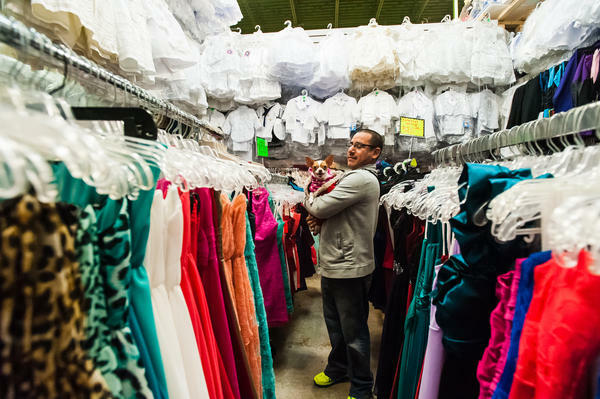 Nor at those places are you likely to find the quinceanera gowns, baptism and wedding trinkets sold at the Plaza. Many of these items are imported from Mexico and neighboring Central American countries and sold here by vendors open to negotiating the listed price with their Spanish-speaking customers—just as they would in their native countries. It’s Not a Mall…It’s a Plaza. On weekends, the Plaza attracts shoppers from as far as North Carolina, Alabama and Tennessee. Mall manager Julio Penaranda credits that draw to more than what’s sold here. He says it’s the atmosphere, which offers a break from their Hispanic clientele’s everyday lives. “They have to battle against people saying, ‘Oh, you’re not welcome here…You’re illegal.’ Here, we don’t care.” It helps, too, that the mall strives to be a one-stop shop for just about anything its visitors may need, from dental work, to tax prep, to tarot readings. It’s also designed with a deep cultural understanding of its audience. Plaza Fiesta caters to the Hispanic tradition of the Sunday afternoon family stroll in the plaza with special events most weekends, as well as blow-outs like the Mexican Independence Day celebration each September. Design elements like the playground, an abundance of family-friendly bathrooms and benches are also intentional. Sure, it’s a shopping mall, but the focus is on getting people to come and hang out, rather than run around and shop. Folks are still spending money. The Legaspi Group, which owns Plaza Fiesta and six other malls like it across the country, reports that Plaza Fiesta took in more than $100,000,000 last year. If you compare this success to the foundering state in which so many conventional shopping malls find themselves in, some analysts say you’ll find a certain blindness about who visits malls in the first place. 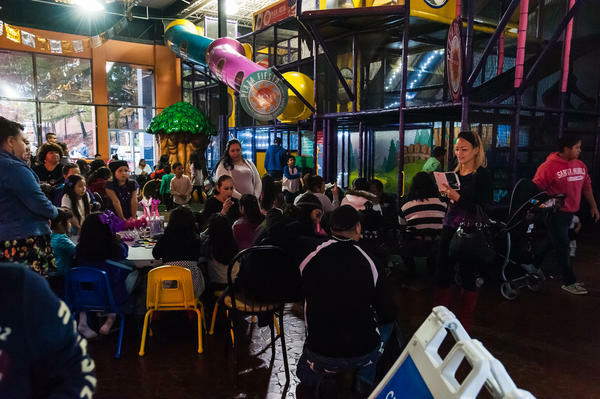 Increasingly, they look like the neighborhoods that surround Plaza Fiesta, which are a diverse mix of family and non-family households, and mostly Hispanic and white residents. So maybe the lesson here for conventional malls is simply paying more attention to who your shoppers are—and that’s a lesson that, if Plaza Fiesta is any indication, is about a lot more than retail. It’s about community. In short, it may mean taking another look at the dream of that founding father of the mall, Victor Gruen. And maybe that’s the takeaway here: imagining malls, whatever their next incarnation may be, as places that are about more than just shopping.